Smoking your favorite foods can really be enjoyable, fulfilling and not to mention a sure way to get the most eats for your buck. I have found that I can purchase meat, fruit and veggies and a pretty good price locally, smoke them for several hours and have plenty of meals or snacks to last a week or two. Of course, if my neighbors catch wind of my smoking, that’ll leave me with a little less which is all good by me. It is a sure way to make friends …LOL! Over the years, it seems like no matter which fuel I use I will always get complimented, however my charcoal smoking seems to be the winner (most of the time). If I am smoking indoors due to cold weather, I will fire up the liquid propane or electric smokers. 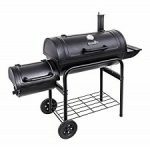 Summertime though, I usually go with my best charcoal smoker only because I can use wood pellets, briquettes or flavored wood for additional aroma and have plenty of free circulating air. 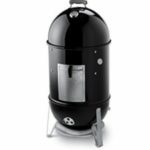 The trick though is to watch the temperature on charcoal smokers as these are less controllable than the electric smokers. 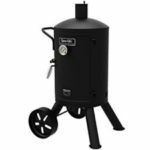 Check out our top-rated charcoal smokers below and be sure, so you find what you really need, to read the contents in the table then the full review for each product. 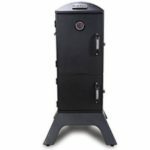 Take a good look at each smoker and then decide which is ideal for you. We listed only brands that we like and will serve you well. 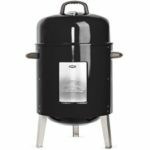 These include Weber, Masterbuilt, Char-Broil and couple others that did well in 2019. Click BRAND name in table to get to a brief introduction about the product then click through again for the full review. Enjoy!